Kumbhalgarh, an imposing fort built in 1458 AD set amid massive ramparts and surrounded by hundreds of temples, the creation of one of Mewar's legendary heroes Rana Kumbha and the birthplace of the legendery warrior Rana Pratap. Kumbhalgarh is located at a distance of 50 kms from Ranakpur, 84 kms from Udaipur, 130 kms from Mount Abu, 200 kms from Jodhpur, 50 kms from Nathdwara and 300 kms from Ahmedabad. Kumbhalgarh Fort: 2 km Indisputably, the Fort commands all of ones attention. It has seven grand gates and ramparts, one within the other. Rounded bastions and soaring towers add to its grandeur. The last gate or the Nimboo Pol has fascinating chambers within. 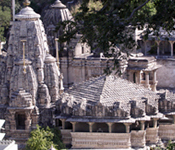 There are as many as 360 temples, mostly ruined Jain temples, the main ones being Nilkanth Mahadev, Vedi, Mammadev and Kumbhaswami Temple. 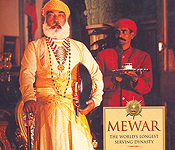 Among the array of old palaces within the fort is Badal Mahal, the highest of all the palaces offering glorious views of the countryside. Built by Rana Fateh Singh in the late 19th century, it has beautiful apartments painted with pastel-coloured murals. Kumbalgarh Wildlife Sanctuary (10 km): Surrounds the fort and is spread over an area of 586 km. The wildlife population includes panthers, wolves, sloth bears, four-horned antelopes and scientifically bred crocodiles, besides migratory birds during winters. 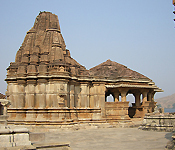 Parshruram temple 9 Km: A Shiva Temple near Kumbhalgarh. Kelwa river: 5 Kms It is one of three water courses Maharana Raj Singh I dammed to create Rajsamand Lake. The other two were the Tali and Gomati. 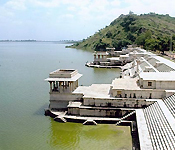 Rajsamand Lake: 45 km The reason for the dam and lake was to provide employment for victims of a widespread drought and famine (1661), and to provide canal irrigation to local farmers. The digging of its foundations began on January 1, 1662. Ranchod Rai, the elder son of Purohit Garibdas, the Royal Priest, laid the foundation stone on April 17, 1665.